Now don't get me wrong. I love "Mouse Trouble". It's one film that makes me laugh out loud every time. 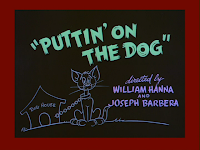 However, "Puttin' On the Dog" does just the same and it's one of my favorite Tom and Jerry cartoons. 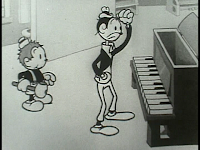 Tom chases Jerry directly into a dog pound. Obviously this is no place for a cat, so Tom swipes the head off of a dog statue and puts it on his own. His feline head now covered, he feels confident about entering the dog pound. The only problem is that he can't seem to keep the fake dog head on. Right off the bat, he gets it caught in the fence, but luckily the bulldog who spots him is not too bright. 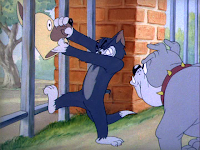 Tom loses the dog head to Jerry and tries to get it back. In the process, he must fake his own decapitation for the benefit of the bulldog. The sight of a headless Tom and the nearby dog head on the ground causes the bulldog to emit a feminine scream of terror. 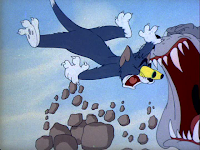 Believing he has caught Jerry with the fake head, Tom grabs onto the bulldog and tries to wrench his head from his body. It's a very funny moment as Tom tugs at the dog's ears and uses his rear end as leverage. A self-inflicted hit on the head causes a lump on Tom's noggin, which will no longer accomodate the fake head. The gig is up, with some assistance from Jerry. 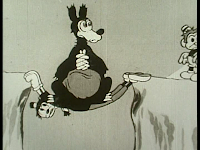 The dog's mouth becomes a steam shovel as he unearths Tom and chases him up a pole. 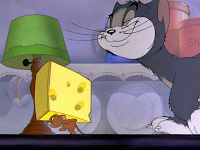 The cartoon has fast-paced animation and a great jazz score, but I guess that can be said for most Tom and Jerry films. This time it just really stands out to me. Sorry about not posting regularly lately. I have been rather busy. 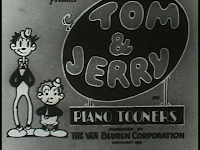 Anyway, we continue on with Tom and Jerry to 1943. 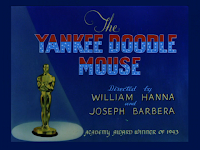 "Yankee Doodle Mouse" is a product of the war years and delivers just that:an all-out war between the cat and mouse. 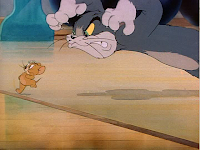 Jerry retreats to his Cat Raid Shelter (the basement) and launches an assault on Tom, who is chasing him. Jerry uses every tool available, from tomato-launching mouse traps, to bottle corks, to spatula-shooting bricks. The violence (for lack of a better word) begins to come into its own here as Tom is blown up numerous times by Jerry's dynamite sticks. 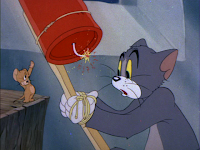 Tom even brings it upon himself when he falls for the classic "reverse psychology" trick as he and Jerry try to pass some dynamite back and forth. 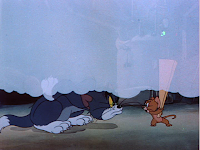 A cloud of flour makes Tom ripe for some floorboard smacks from Jerry, but the mouse's egg carton plane is shot down by the cat with fireworks. Finally catching Jerry, Tom begins to tie the mouse to a rocket but ends up tied to it himself and is launched to the heavens, giving Jerry a fine 4th of July display. Sometimes, just the location of a Tom and Jerry film gives you an idea of the pain that will be involved for Tom. 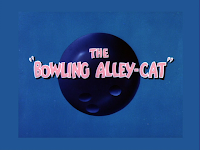 Such as it is with "Bowling Alley-Cat". 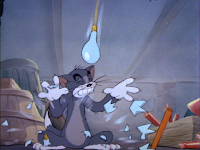 The slippery bowling lanes are the perfect skating rink for Jerry, but Tom is unable to stand up on the waxy surface, as he tries to catch Jerry. Jerry flings the cat into an ashtray and Tom is left with a mouthful of cigarette butts. The sport shifts a bit when Tom pitches a bowling ball at Jerry, who uses a bowling pin for a baseball bat. In this situation, Tom does what anyone would do: try to catch the bowling ball. 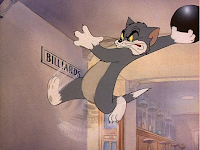 A train of bowling balls is sent after Jerry down the ball return, but Tom ends up with a mouthful of one, while the others smack his rear. The "ouch" scene for this film would be when Tom's head gets caught between two bowling balls. Clunk! 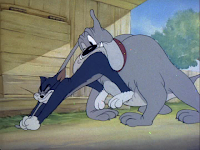 A recurring question to me is: Why does Tom never feel when Jerry is tying the cat's tail to something? 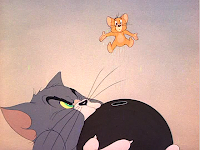 Here, Jerry ties Tom's tail to a bowling ball, resulting in his being thrown down the alley, through a brick wall and into a trash can. Jerry tallies up his bowling score. 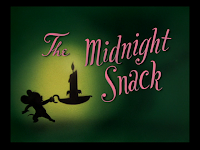 The slow pace of the Tom and Jerry films continued with "The Midnight Snack". 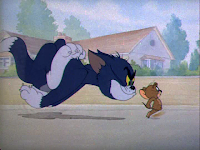 Jerry breaks into the refridgerator in the middle of the night, but Tom is wise to him. As Jerry makes off with a piece of cheese, Tom constructs an obstacle course before the mouse, complete with a bread staircase and a rolling pin. 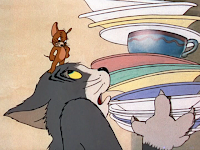 Whe Tom's fun with Jerry results in crashing dishes, Mammy runs downstairs to investigate. 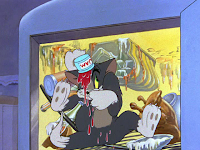 Tom frames Jerry for the mess and Mammy begs Tom to catch the mouse. 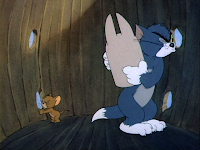 Jerry gets the upper hand by trapping Tom on an ironing board and sending the cat crashing into the fridge. 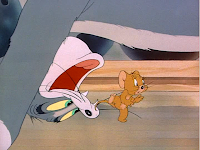 Mammy finds Tom inside, and as Jerry eats his cheese reward, Tom gets an off-screen beating by his owner. 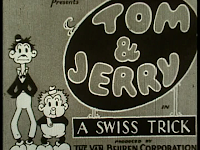 These early films are charming in thier own way, but the best was yet to come, as Tom and Jerry shift things into a higher gear. 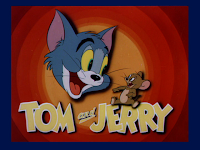 As with most characters, Tom and Jerry are not fully formed in thier first appearance. 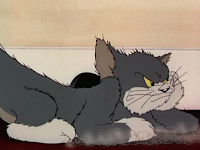 In "Puss Gets the Boot", Jerry is not as rounded and cute as he would become, but more striking is Tom's scruffy, furry appearance, as well as the fact that his name is not Tom yet, but rather Jasper. So, Tom...I mean, Jasper...is toying with Jerry until a vase is broken. Jasper's owner, Mammy Two-Shoes (who is only ever shown from the waist down, keeping the action from the perspective of the cat and mouse) quickly lets Jasper know that if he breaks one more thing in the house, he will be "O-W-T, Out!" Jerry realizes that the best way to get rid of Jasper completely is to break something and blame it on the cat. Whenever Jasper gets too close to him, Jerry threatens to drop a glass to the floor. Some well-placed pillows by Jasper quickly ends the threat, until Jerry begins flinging plates down upon the cat, forcing Jasper to catch them and keep them from breaking. Soon, Jasper has a stack of plates, bottles and glasses piled ceiling-high in his arms. Some final taunting from Jerry, plus a swift kick in the rear, send the entire pile crashing to the floor. Mammy arrives swiftly and drags Jasper out of the house, much to the delight of Jerry. It is interesting to see how the pace of the Tom and Jerry films starts off rather slowly. Over the years, they would become much more energetic and wild. I think it's safe to say that the arrival of Tex Avery to MGM had something to do with it. 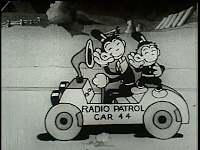 1940 was quite the year for the birth of many of the greatest cartoon characters. 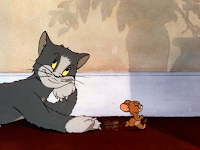 Tom and Jerry's films could be seen as just cat and mouse shenanigans, however, they are so much more. 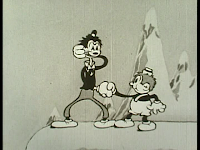 The animation in most of thier films is fluid, fast-paced and energetic. Wild "takes" fly like crazy and new meaning to the word "pain" is expressed. I hate to use the word violence when talking about cartoons, but if it is ever appropriate to do so, now is the time. I can literally feel Tom's pain in some scenes, and to me, that is the result of the believable work done by Hanna/Barbera's staff. These films are breathtaking to watch, and they are good for lots of laughs as well. A simple cat and mouse chase? Or rather one of the best cartoon series of all time? I vote for the latter, but I'll let you decide for yourself as we journey through the years with Tom and Jerry. In "The Magic Mummy", Tom and Jerry are police officers sent on the trail of a mummy that was stolen from a museum. They track down a mysterious figure who goes underground at a graveyard. The mystery sorcerer brings the mummy back to life and forces it to sing for him. Our heros try to apprehend the villian but get thier skin literally ripped off thier bodies momentarily by the sorcerer's magic and are locked away in the wall. Tom and Jerry escape and try once more to stop the sorcerer, who is now making the mummy preform in front of a ghoulish skeleton audience. 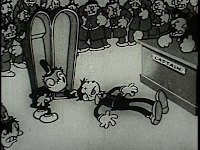 In the confusion, Jerry grabs the coffin, believing it contains the mummy, but when he returns to the police station, it is revealed that Tom is actually inside. 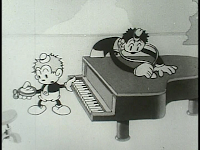 Piano doctors, Tom and Jerry, are in charge of getting the star's instrument in perfect order for a big performance. 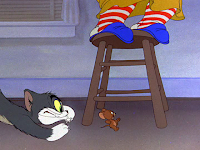 While Jerry deals with interfering mice, Tom literally extracts a sour note from the piano. Jerry whacks the note with a mallet, then kills it by smacking it on the wall before flushing the note down the toilet. The hefty star of the show crams herself into her outfit, only to collapse during her performance. Tom and Jerry to the rescue. The duo give the piano a check-up, complete with stethescope and some pulse-taking by Jerry. Tom pulls a key from the piano like a bum tooth. 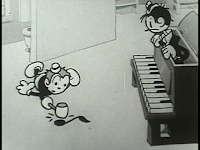 The star recovers and interrupts Tom and Jerry's party with a performance that literally raises the roof. All in all, a must-see cartoon. 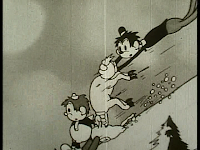 Tom and Jerry climb aboard a train in the Swiss Alps,, but when the train gets tired out from climbing a vertical slope, it's up to a rescue dog to save the day. The dog is surprisingly not a St. Bernard, but it does have the barrel of booze required to get the train up and running again. The train deserts our heros, who then have a run-in with a goat and a bear. While playing around with the echos in the mountains, Tom's head is knocked off momentarily by his own rebounding voice. The duo is lured by a piece of swiss cheese into a tavern, where thier musical hijinks please the crowd. 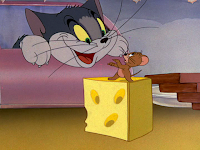 Tom and Jerry swipe a piece of swiss cheese and share it with each other. All seems well, until holes began to form all over thier bodies. Since the two now look like pieces of cheese themselves, they are chased off by a horde of mice from the tavern. Surrealism, without a doubt. 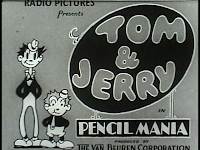 Long before a certain cat and mouse blazed across the screen, two humanoid characters named Tom and Jerry were introduced at the Van Beuren studio. 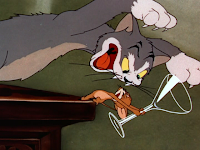 Cartoons in the 1930s tended to be very surreal, and the films of Tom and Jerry were no exception. 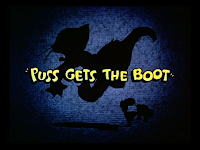 The short-lived series only lasted 3 years, so the cartoons have slipped out of public consciousness, especially since the character's names are now completely associated with MGM's cat and mouse. 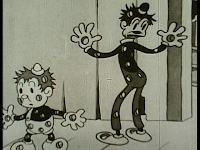 The Tom and Jerry cartoons are a decent representation of the Van Beuren studio and over the next three days, they will be highlighted here.